What makes the Device Manager so special? Monitor your system requirements from one central location. Device Manager, a web-based server software, is capable of monitoring nearly all output systems installed on your network. Instant email notification of low paper levels, jams and other system incidents are sent directly to the IT-Administrator or key operator and leads to reduced response time. In addition, Device Manager automatically transmits the status of toner shortage per email and allows remote access to counter data. The IT administrator is assisted with a once define, repeat install function, avoiding repetitive installation tasks on several systems within the network. When changes occur in the network, the printers and copiers can be easily adapted. Workgroups, departments and divisions can be re-grouped with access to pre-defined devices. Nevertheless, if the user requires access to a specific ineo device, Device Manager leads the user via a direct link to Web Connection, the user interface to the digital systems on the network. Apart from a clear arrangement and time-saving “Device-Search” function it is also possible to remotely reboot the devices after changing network settings or to fix an error. This allows IT-Administrators to save immense time, especially in network environments with long distances between the systems and the operator or separate buildings. If you are considering first-time entry into centralised print management on your company network, then Device Manager is without doubt the best entry-level choice. What does the Device Manager offer? Open panel, output tray full etc. Device Manager is ideal for use in companies, associations, public authorities, schools and institutes requiring cost control for their output systems. A company’s productivity can be greatly influenced through the use of multifunctional digital systems. In order to fulfil this important role they must be constantly available and regularly replenished with toner. A historically grown printer and peripheral system environment is not easily surveyed and error reports cannot be dealt with from one central location. Running out of toner due to a delay in the order process can result in a major disruption of the company’s workflow. 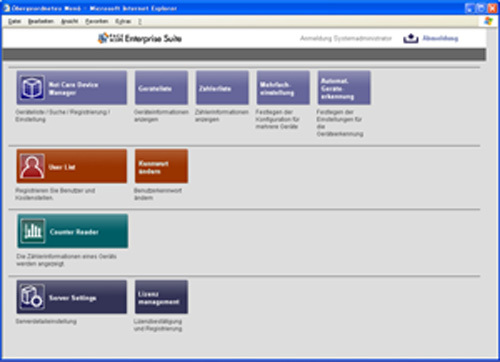 Enterprise Device Manager offers the ideal solution for this type of problem. 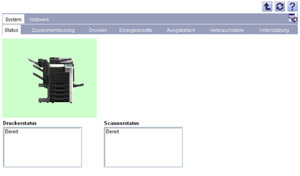 This server based solution sends status and counter information on all integrated systems directly to the administrator. As a result, any lack of toner is immediately registered so that it can be re-ordered and delivered in good time. This direct messaging quickly eliminates malfunctions while considerably lowering the cost of administration.